I am looking for the parts in the attached picture. 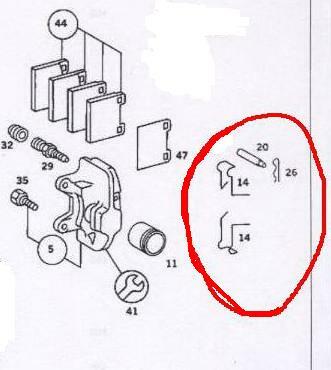 The main thing I am looking for is #14 but I would like to find the other parts circled in red also. These parts are for the Bendix calipers. If anyone is parting out a car and can look for these let me know. O'reilly and probably others have disc hardware kits for Bendix calipers. Might take a day or two to order them. You can buy all those from Phil. I found some stainless steel versions of those little clips(#26) which work really well. West Marine should carry them. Phil/fast lane said they are a dealer only item. The dealer wants $25 per spring and there are a total of 8 on the car and no pins or clips.. The link that techguy posted came through at $22.99 for a set of 4 springs, 4 pins and 4 retainer clips for the rear and $21.99 for the set for the front. The best I was able to do locally was $12 each spring for the fronts and $18 each for the back and they didn't have the pins or clips. Well usualy you don't need to replace the springs unless they rust apart. I know I had to get a couple of pins a long time ago and I don't remember them being crazy expensive. For $25 a spring I'd just get rebuilt calipers!